Power up for the ultimate robot battles! 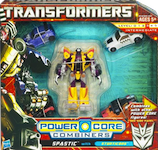 Your GRIMSTONE Commander vehicle is already a virtually unstoppable opponent in his Commander Triceratops mode and Commander robot modes. But his strength gets increased five-fold when you convert him to Power-Up mode and convert his DINOBOTS drone figures into his limbs! And the action doesn’t stop there. 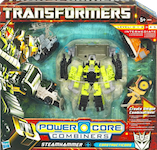 With this Power Core interchangeable robot combination system, MINI-CONS® (sold separately) and drone vehicles can attach to power up any Commander figure. Collect more packs and you can create tons of unique and fierce robot battler figure combinations! Five-pack includes figures of GRIMSTONE, Spinosaurus Drone, Pachycephalosaurus Drone, Ankylosaurus Drone and Parasaurolophus Drone. 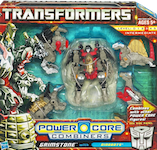 SUMMARY: Exciting five-pack of robot figures includes GRIMSTONE robot-to-vehicle figure and four DINOBOTS drone figures that convert to limbs for his Power-Up Mode! Five-pack includes figures of GRIMSTONE, Spinosaurus Drone, Pachycephalosaurus Drone, Ankylosaurus Drone and Parasaurolophus Drone. Ages 5 and up.